After this week’s first act, I’m convinced this show excels at getting us to underestimate Asai Kei, at least as much as his adversaries do. Last week Eri Oka seemed to be holding all the cards, but it turns out Asai isn’t trapped in the photo for more than a few minutes. 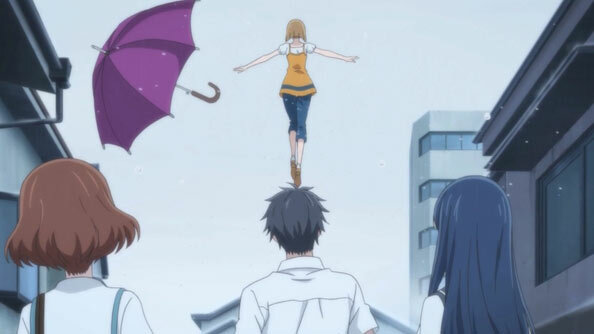 Even though that buys time for Eri to mess with Haruki, Asai has Murase in place to mount a rescue. 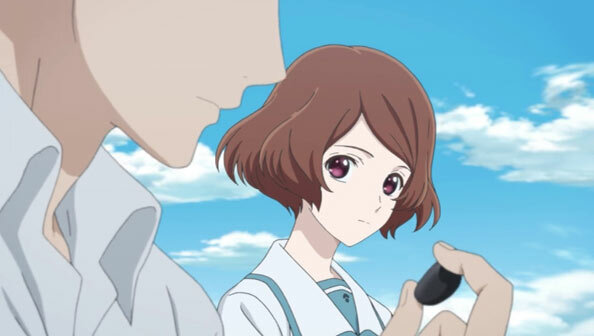 A rescue that occurs after Eri tries to plant false memories in Haruki, which not only doesn’t work (thanks to a little device in Haruki’s ear with Asai’s voice) but restores Haruki’s Reset ability. It’s a great little turnaround, flummoxing Eri, who retreats for the time being. 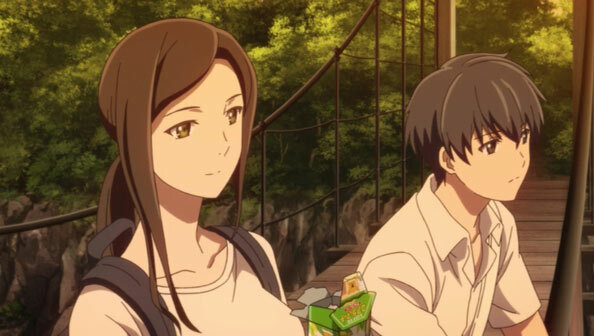 And having Asai and Haruki back together underscored how much anxiety I felt when they were apart. Of course, I’ve seen all their interactions thus far, but it’s important to remember Haruki doesn’t remember a lot of them. 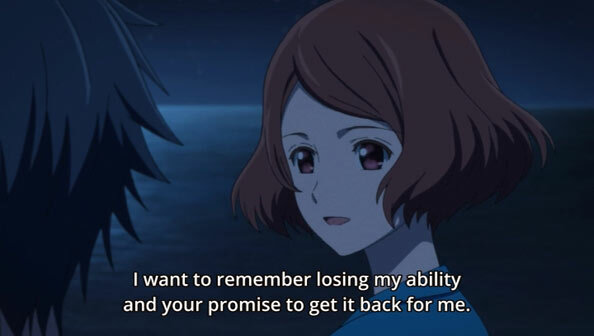 That’s why she’s not keen to immediately reset; she wants to remember what Asai did for her. So instead of resetting, she saves, and Asai returns to the Sasano case, apparently confident Eri won’t be bothering them for a while. 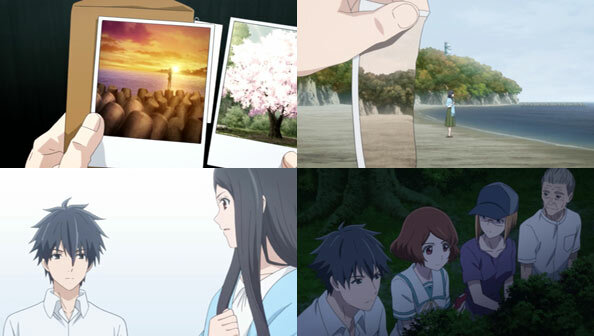 The next morning, Asai receives a message to “come see someone”, and three photos, one of a woman on the beach, another of a blossoming cherry tree, and the third, Souma Sumire at sunset. Asai assumes it’s the “Witch” who is summoning him, so he goes to the beach. There, he takes what he learned from his encounter with Eri, enters the photo, and converses with the Witch in her younger form. 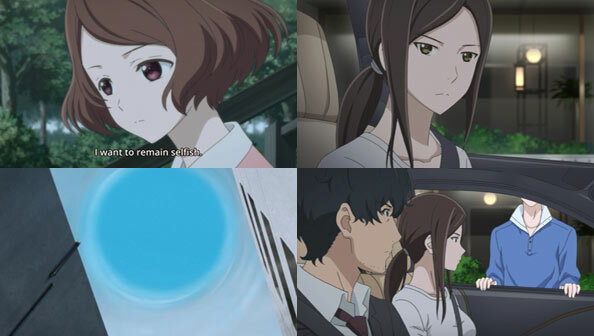 Because her ability is knowledge of the future, she knows what she’s going to do, and when she’s going to die, and wants to escape the bureau to see Sasano before that happens. 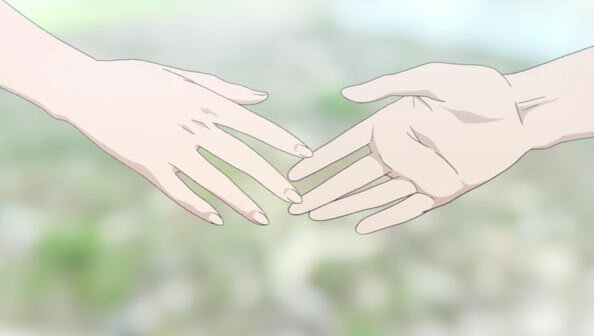 To that end, she used both Asai and Eri, but presents Asai with a choice: he can stop Eri, possibly leaving the Witch to die in confinement, or save the Witch another way (a way she may already know he’ll implement, mind you). This infiltration of the Bureau is only preparation for the next infiltration, when the actual rescue of the Witch is to take place. Asai has Haruki reset, sending him back to when they saved on the beach. He then jumps into one of the photos they took of the Witch’s room and asks her to call him. 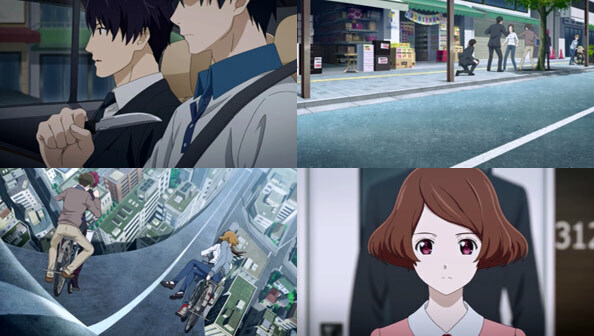 The photos are still around because Murase had them, and her power negates reset, while his communication with the Witch of the past reaches the Witch of the present because she knows the future. It’s a complicated metaphysical labyrinth, but it checks out. 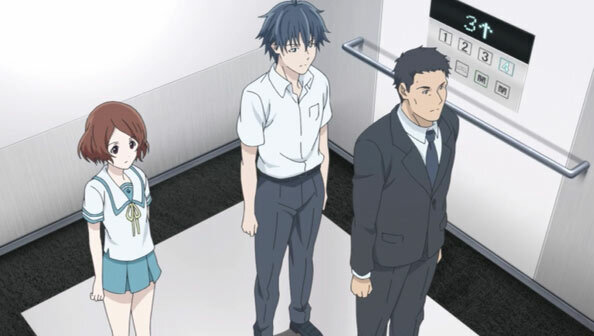 Before pulling it all off, Asai meets with a surprisingly chipper Eri, who accepts her loss but isn’t ready to give up on beating him, thus proving he’s weaker. Asai, meanwhile, knows that she won’t hurt him as long as he’s “defenseless.” Considering this is a long show, Eri is sure to be back; we’ll see whether she poses a greater threat at that point. 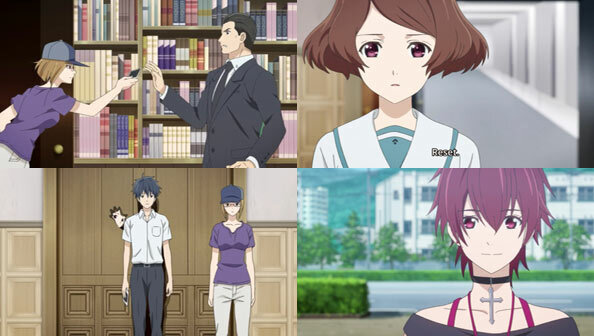 As expected, Asai gets a call from the Bureau, who bring him to the Witch, who asks him the same questions about “loving a stone” she asked Haruki, to which Asai answers he’d still love the stone if it was the girl he liked. 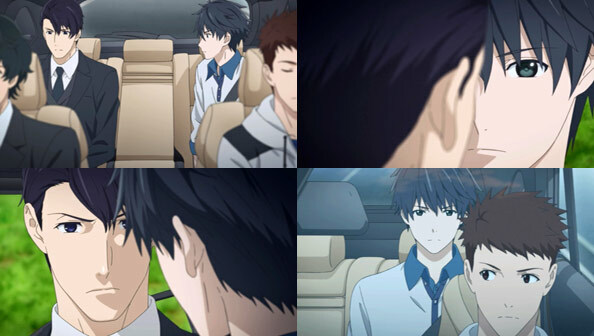 But is that girl Asai…or Souma? 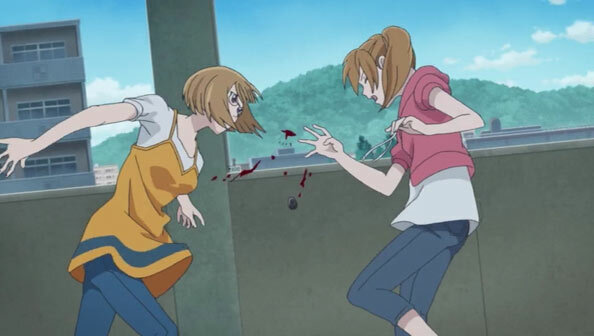 Regardless, Asai gives the Witch the photos she needs to escape and knock on the window of her boyfriend, just like the story Sasano told her when they were far younger. All these years, the Bureau has kept her under lock and key, fearful of her power. But after a time, or maybe all along, it was a power she never seemed all that interested in having, let alone using. 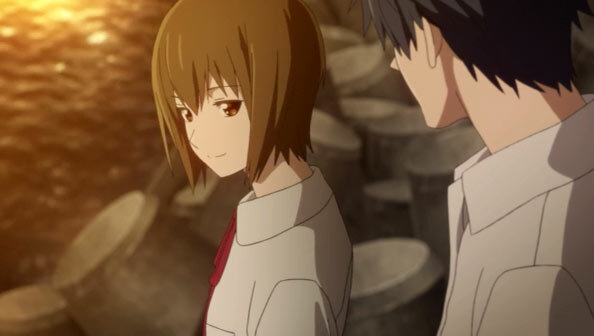 That’s why she decides she’ll leave Sakurada, forget about her power altogether, and live out the rest of her days—all seven of them, by her reckoning. 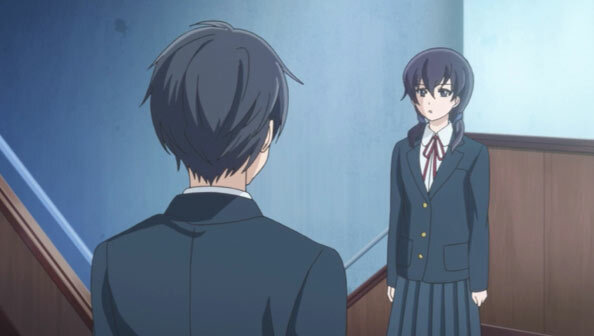 But before she does, she indulges Asai by telling him his future: he will be involved in “something big”, something involving her “successor”, whom Asai correctly identifies as Souma. The Witch tells him he’ll run into her again. I certainly hope so! Whew, what a ride. This mini-arc contained the most complicated ability machinations yet, and it was downright exhilarating watching all the pieces be carefully maneuvered into place before being set into quick, decisive motion. On top of that, we got confirmation Souma isn’t totally dead (though whether she’ll merely exist in that photo or not, who can say). 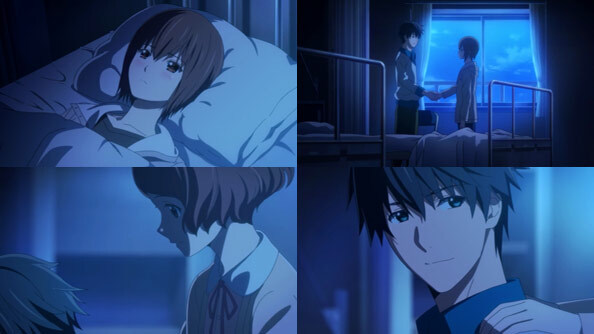 By not forgetting what Asai did for her, Haruki’s affection for him continues to grow. Murase is proving to be useful as “muscle” (i.e. 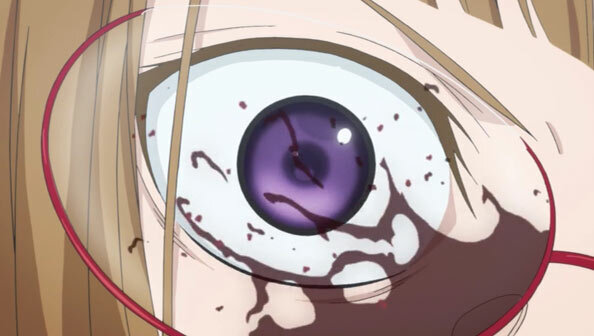 putting holes in things or neutralizing abilities) while Eri has vowed to come back at Asai, insisting he should “be afraid.” One thing I’m not afraid of: losing interest in this unapologetically bizarre, engrossing show. 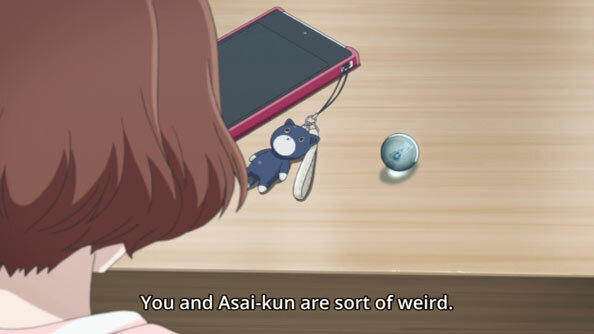 I could not have said it better than Tsushima myself: Things are getting complicated, and for once, Asai has a worthy adversary who manages to stay a step ahead of him the entire time, leading to even higher stakes by episode’s end. But let’s go back to the beginning, and the photo by Sasano that entices Asai so. 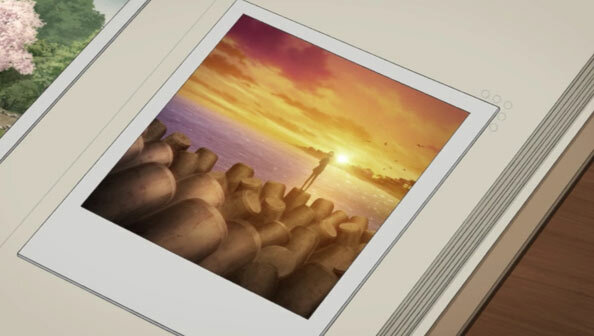 It’s indeed a photo of Souma Sumire, on the same beach where they first met and promised to meet again. And I suppose he could, in a way, by entering the photo as Sasano does. Extremely unsettling metaphysical ramifications aside, we also learn something simpler: the evolution of Oka Eri. 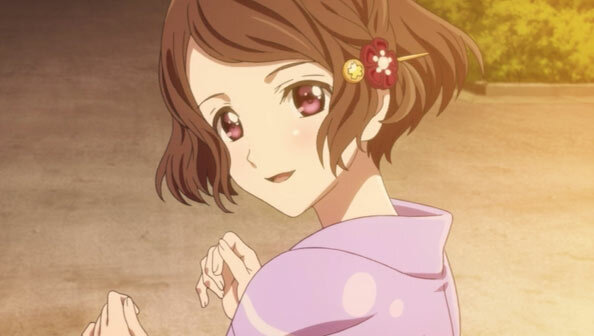 She was once Fujikawa Eri, before the hair-dye and contacts and rad clothes; the “weak and worthless” daughter who took abuse from her father. Two years ago, Asai saved Eri by telling her to change her name and use a piece of evidence to blackmail her father if she so chose. Oka Eri was born, and I believe part of her believes that she’s paying Asai back by confirming his weakness, in hopes he’ll return to his former strength; the hero to her villain in this story of life. 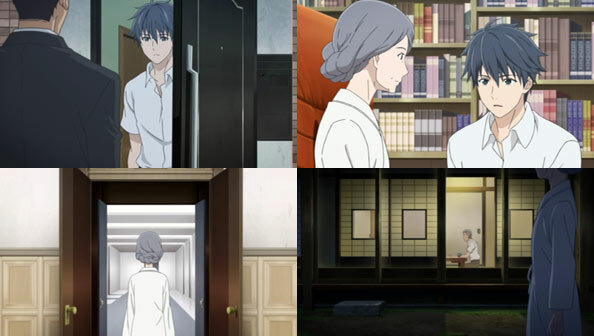 Asai has moved on from the person he was two years ago, but meanwhile, Sasano is able to travel to 28 years in the past where a much younger Oracle lives inside one of his photos. The two of them have a plan, and it’s a long-game kind of plan. 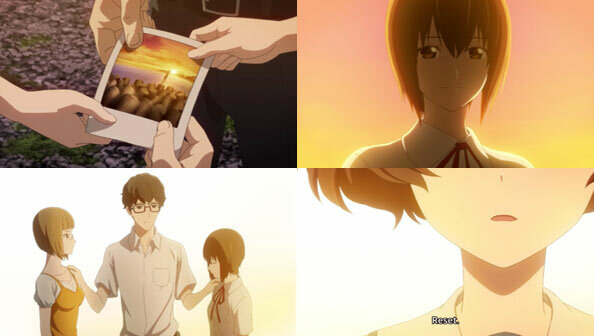 When Sasano tells her the Bureau is going to try to shut him down, she tells him not to resist, but to give her a certain selection of photos before they come. 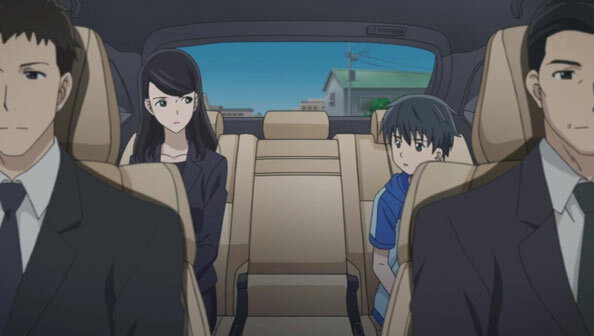 Asai all but confirms how soft he’s gotten since meeting Asai by being drawn away from her all too easily by a frantic phone call from Murase Youka. 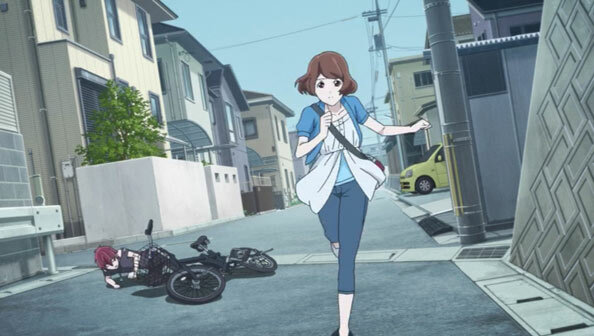 On her own, Haruki does her best to get away from a pursuing Oka, but around five seconds of eye contact are all the villain needs to steal her reset ability. 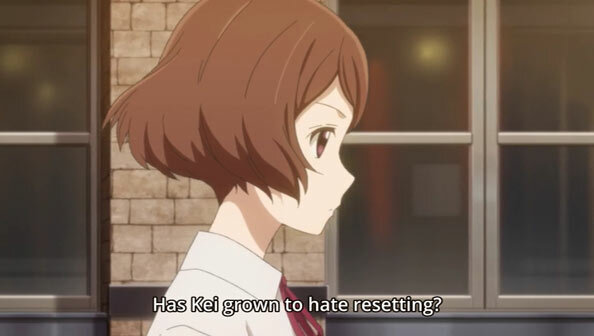 After confirming she can’t reset, Haruki begs Asai to help her get it back, and he agrees. 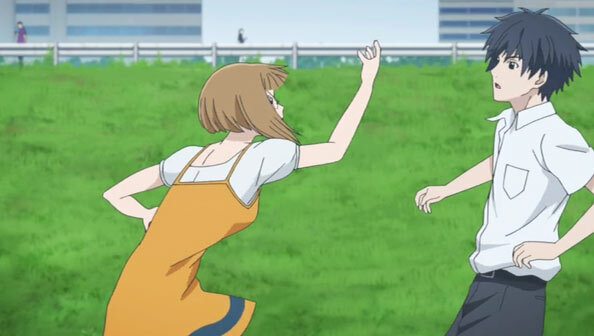 He’ll accede to Eri’s demand for the MacGuffin in exchange for Haruki’s ability back, then learns more from Tsushima about Eri’s ability and its weaknesses, which will no doubt be pivotal in his counterattack. However, he doesn’t get to make one this week. Standing his ground on having moved on from the “hero” Eri saw him as two years ago and worshipped, he offers the MacGuffin without any resistance; his only goal to restore Haruki’s ability. 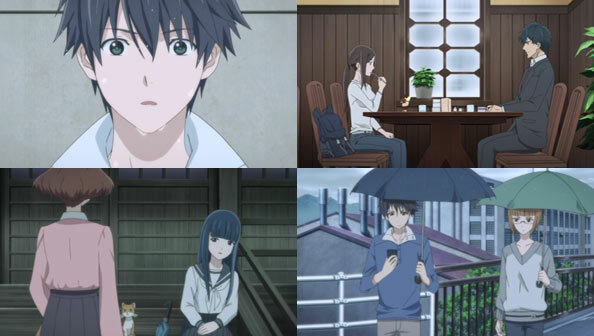 But Eri has another trick up her sleeve, which digs an even deeper hole for Asai and Haruki: she traps him in a photo of the lighthouse balcony they’re on, taken during the day, underscoring how hopelessly cut off he is from the “non-photo” world. 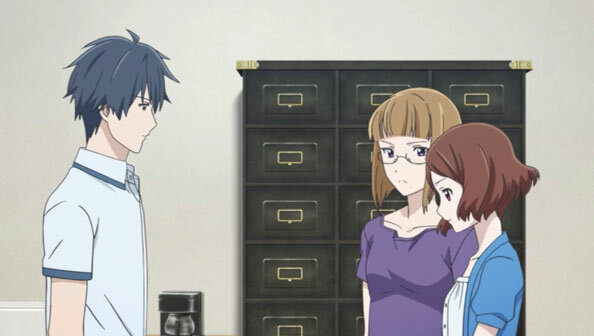 And poor Haruki, who trailed after Asai, hoping the plan would work out, is once again vulnerable to Eri’s whims. …And that’s before we even get into whatever Sasano and Oracle are planning. 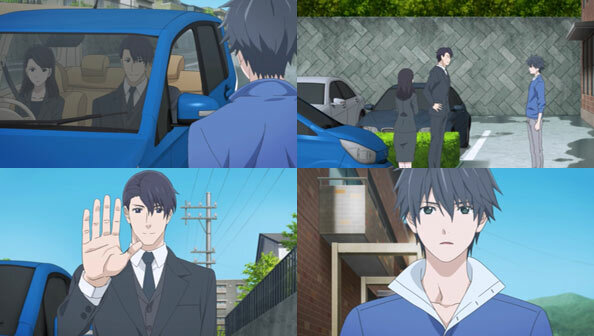 Well, we know how he chose, and it leads to his latest assignment: meeting with Sasano, an elderly gentleman whose ability to enter photographs (and thus, relive moments from the past his photos capture) has been taken away. He wants the MacGuffin to get his ability back, but Kei believes there’s a more surefire way: use his and Haruki’s powers to stop whoever sealed his ability before they seal it. 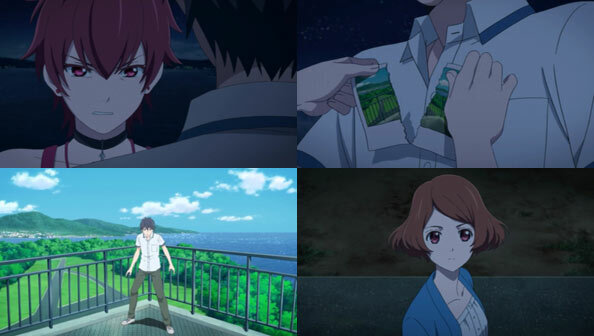 When Sasano insists on repaying Kei once he restores his power, Kei asks if he’ll use his ability for him, after seeing a figure on the beach in a photo that could very well be Souma Sumire, the loss of whom no doubt weighs upon Asai every day. Perhaps seeing and hearing her one last time could assuage that regret. 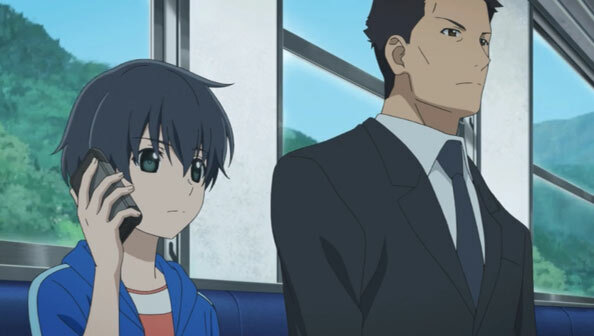 A chat with Hitsuchi-kun reveals that Sasano was one of the founders of the Bureau. 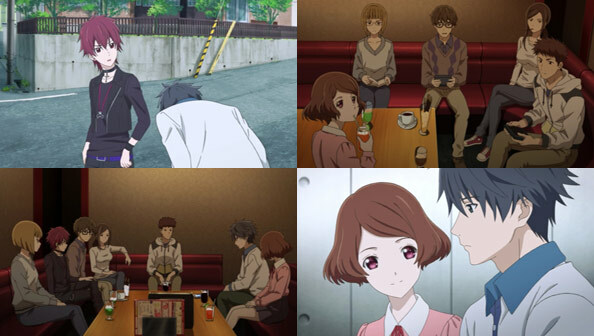 After not getting changed in front of Haruki (who’d have been totes okay with it) and enjoying a lunch she prepared for them, Kei tells Haruki the thought experiment of the “Swampman”, and it leads to Kei assuring Haruki he’d be sad if she died and was replaced by someone who looked exactly like her. Furthermore, he wouldn’t want to go on living without knowing the truth. Both assertions please Haruki. 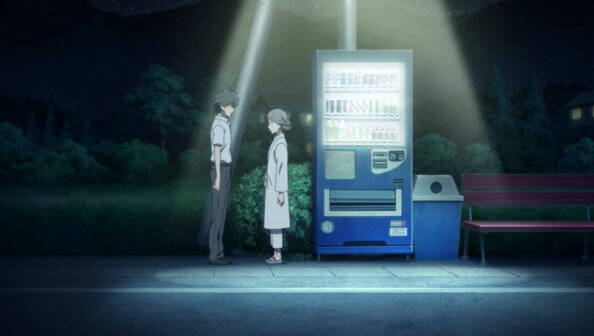 The two are then summoned, as Tsushima assured them they would be, and they accompany the same suited man who approached Kei on the train years ago. 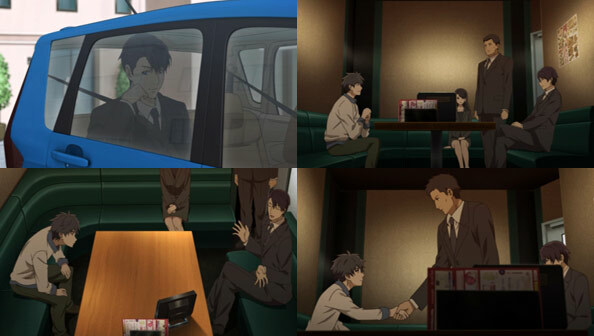 They’re then separated, as only one of them at a time may meet with the person who wants to meet with them. That person turns out to be another founding member of the Bureau, or at least a facilitator. She has no name, and refers to herself as a “witch” with partial jest and partial wistfulness. 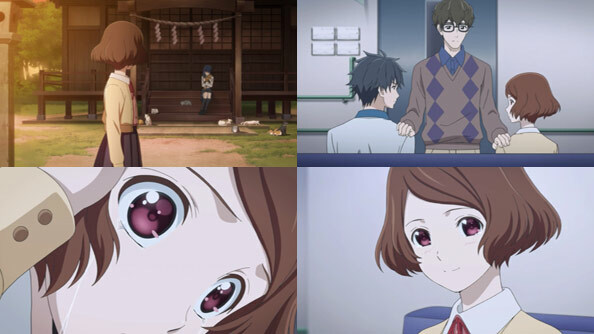 In reality, she is an oracle, able to see the future, both of Sakurada, the Bureau, and individuals like Kei and Haruki. Naturally, she cannot tell them those futures, but only offer riddles, much like the Oracle of The Matrix. 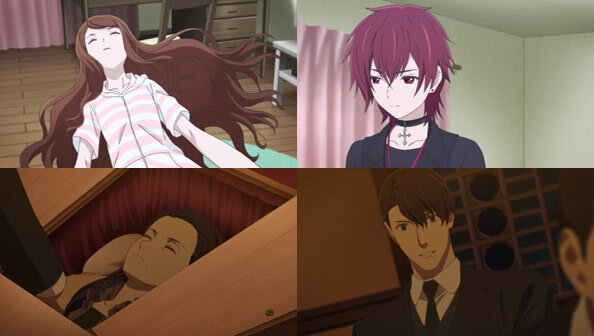 Aside from educating Kei on her purpose, and the fact she is near death, the “witch” does not dispense as much knowledge as she likely gains by seeing Kei’s future. She also “apologizes” to him but doesn’t say what for. 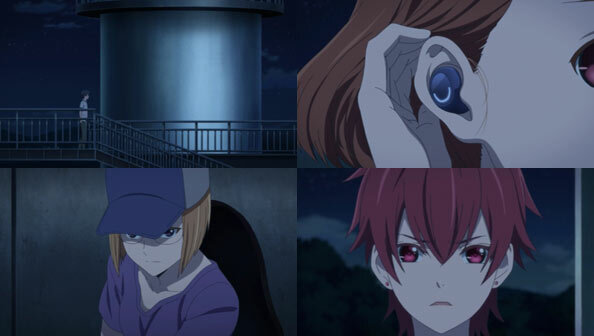 As for Haruki, the “witch” presses her on how she feels about Kei and why, talking about a stone with thoughts that can be turned into a human and whatnot. Ultimately, it’s a simple “chat with a girl about love”, and after reading her future, the “witch” has all she needs and bids her farewell. 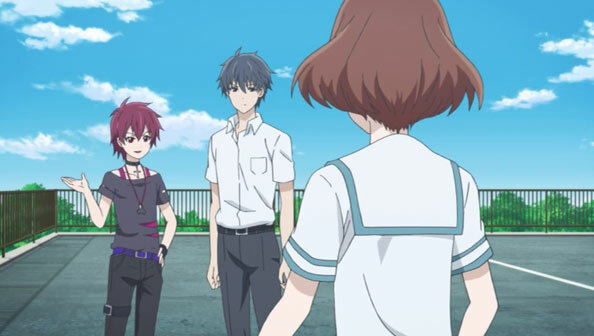 After Kei was dismissed, he is confronted by Eri Oka, the girl who took Sasano’s ability; someone he knows and who knows him, calls him “senpai”, and a “hypocrite” and thinks he used to be “more badass”. She’s there for one thing: to be the villain, causing trouble for people. Her specific threats: to take the MacGuffin from Kei, then take away Haruki’s Reset ability. 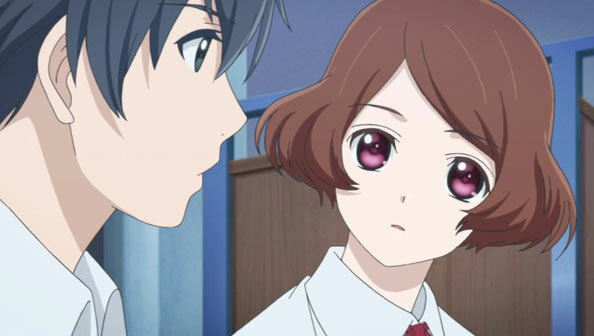 She claims to hate Kei, and wants to see him hit rock bottom…and taking Haruki’s power would certainly do that! 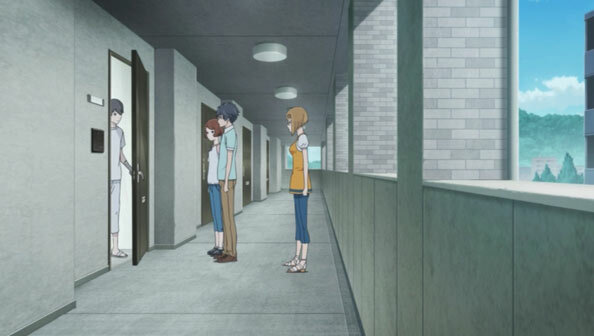 So when Haruki emerges from the building, he immediately requests she reset, and she does. Oka Eri likely assumed Kei would get a reset or two in in an attempt to thwart her plans, but the threats have been dispensed. Now Kei and Haruki have to figure out a way to defeat her. She’s a bit stiff and obvious as a villain, so I’m wondering if she’s truly what she says she is, or merely using her villain persona as a means to test the service club’s dynamic duo like they’ve never been tested before. Either way, it should be an interesting confrontation. 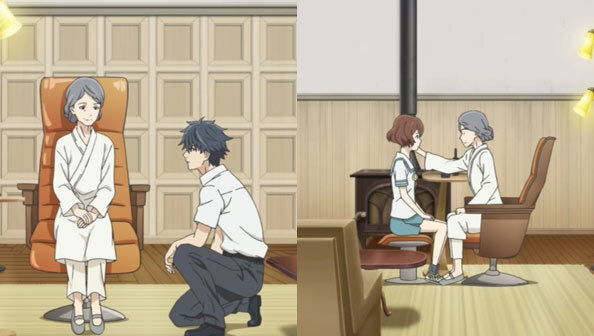 If you’d have told me prior to this week’s episode that we’d not only go back to Asai and Haruki’s first job as high school service club members, but that that first job would involve a student stuck in the reflection of a marble, I’d have thought you were off your rocker. 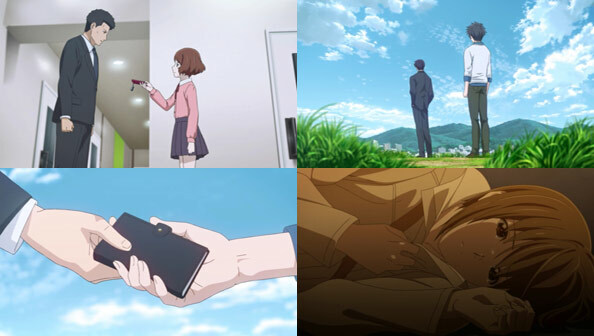 But that’s Sagrada Reset for you: full of surprises and unapologetically weird in its execution of those surprises. 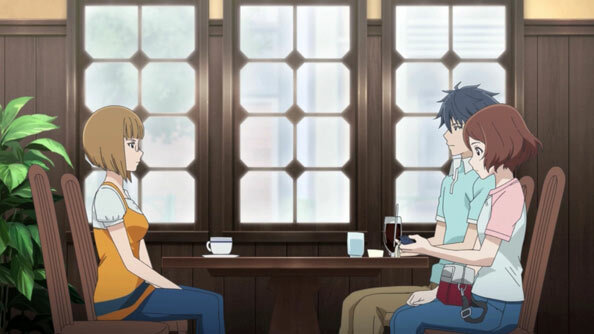 The non-Patema, yet still Inverted Sera Sawako serves as a fresh lens from which to view our lead couple, and she’s candid in her assessment, as you can see above. But she doesn’t think that’s a bad thing, just as she’s not particularly panicking about being stuck in a marble’s reflection, despite the inconveniences. 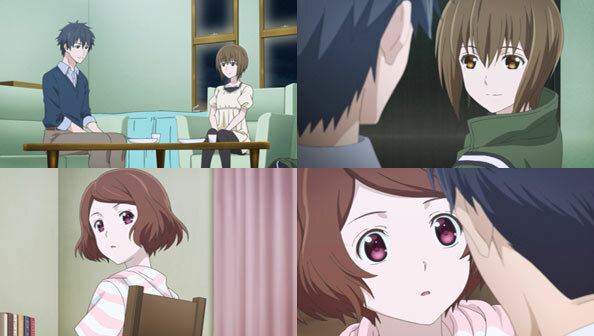 She even inadvertently gets Haruki to start using the same vocal patterns as Asai, which Sera finds even weirder, while Asai can see the upside, but would rather Haruki spoke like Haruki, which was a clever (if oh-so-subtle for a non-Japanese speaker) bit of voice acting by Hanazawa Kana. As this is the first job, it’s not a particularly difficult one, and certainly less bloody than the one involving Murase later on. 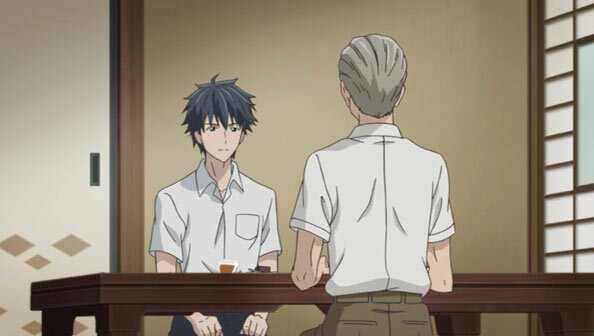 They only need one reset, and even though Tsushima tells Asai to reset immediately, the fact they were to meet with Sera-in-the-Marble (during an expensed meal) tells Asai that Tsushima is hoping the duo will do more, and they do. That includes contacting Sera’s middle school friends and learning her unwanted nickname from then was “Student Monitor” due to her perfect attendance and penchant for warning students who broke the rules. It all stems from a conversation she had with her elementary school teacher about the “pure object” within her that lets her see only pure things. Sera’s ability is to transport her consciousness into the reflection of something pure, but Asai surmises the ability only activates when she desires to do something impure—like not worry about being late for the opening ceremony. 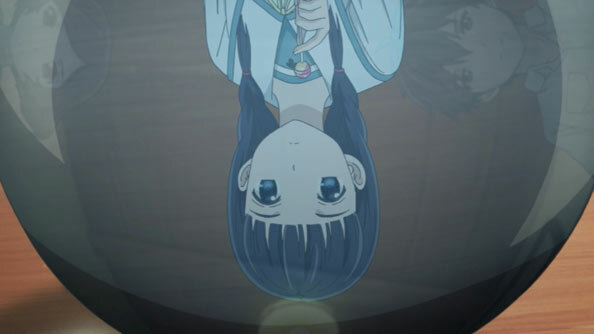 In exercising her right, nay, responsibility as a youngster to be irresponsible at times, she literally and figuratively ends up in an stange, inverted new world, and she doesn’t really like it. Asai also picks up on the fact that despite the strife it may have caused her, Sera wants to stay true to herself, and continue to have that impossibly “pure object” exist within her. In that regard, her foray into the marble is almost a punishment for not being true to herself. 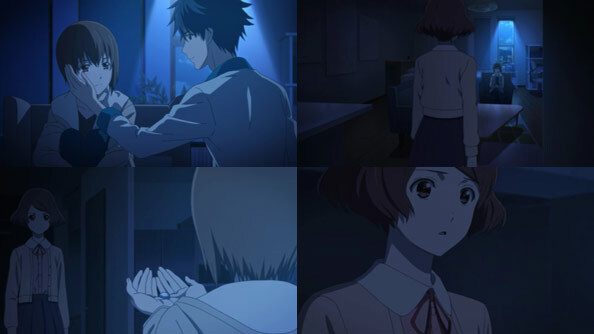 When Asai tells Haruki to reset, it’s at the very last moment, once he has all he needs to resolve Sera’s predicament. The next time she spots a marble in the street, Asai beats her to it, so she’s not late for her bus, and arrives at the ceremony on time. 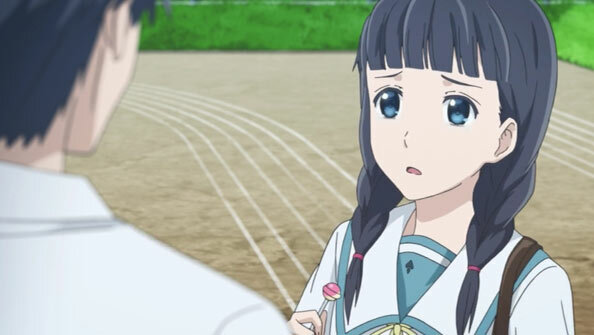 Still, she heads to the field instead of the auditorium so she can eat a lollipop, which she assumed was against the rules (causing tears to well up), only to learn from Asai that it isn’t (since they’re technically between classes). 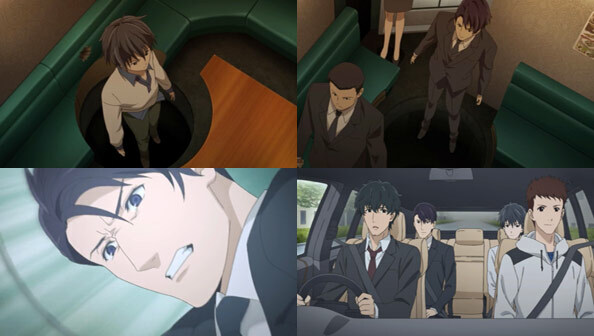 Asai isn’t 100% sure Sera will never end up in a reflection of something again, but he and Haruki did as much as they could, and she’s out of the marble, so it’s first mission accomplished. 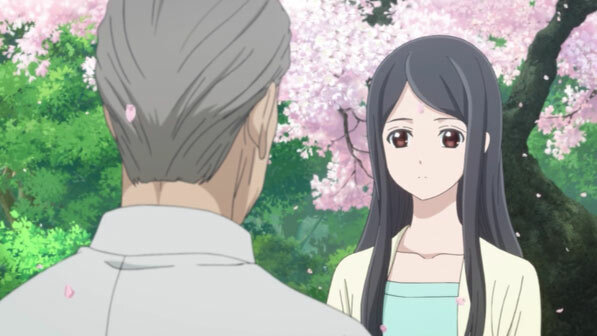 And just to bring it all together, as the cold open showed, the one to lead Murase upon her introduction to her class in September is none other than Sera Sawako; both of them beneficiaries of Asai and Haruki’s services. 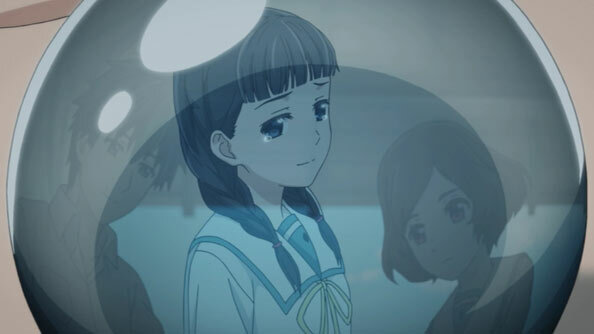 Two years have passed, as has Souma Sumire, and Asai Kei is a lot more careful about changing the future after losing her. 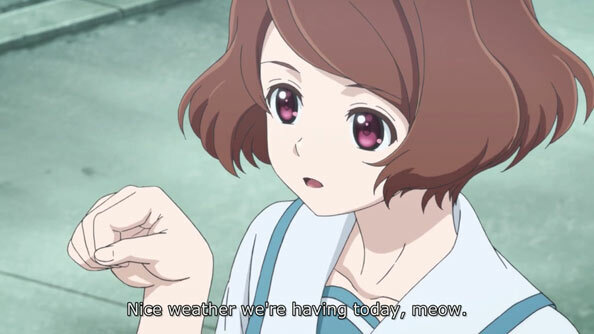 But when client Murase Youka comes to them requesting they revive her cat (recently killed by one of the anime world’s infamous murderous drivers), he dives into the mission with what passes for him as enthusiasm. It would, after all, prevent the client from shedding tears (though she doesn’t strike me as the emotional type) and that’s the reason Asai got into this business with Haruki. 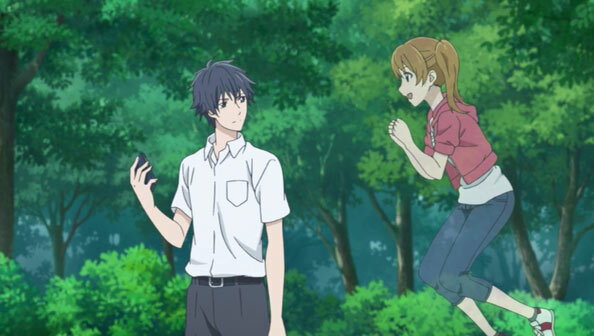 As Asai and Haruki investigate (which leads them to a cat-loving and cat mind-inhabiting informant) there’s an ongoing flirtation being carried out, mostly by Haruki. 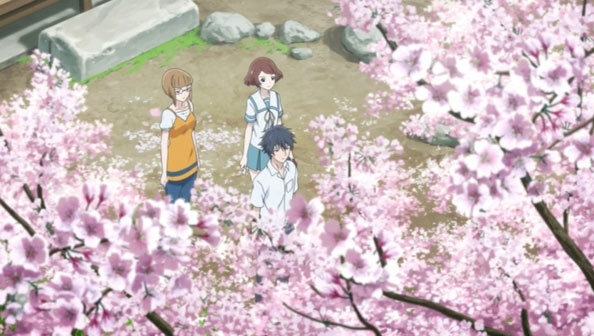 Sure, Haruki is kind of muddling through, and Asai isn’t the most receptive (he’s seemingly put off when she talks like a cat or asks if she should wear a new yukata or miniskirt), and it might be the stealthiest romance of the season…but it’s a romance in play nonetheless. That, and Hanazawa Kana’s measured but increasingly warm delivery, keeps me from going all Seika Nono and falling asleep over this show. I’m not going to make excuses, it is slow, and deliberate, and sometimes boring. 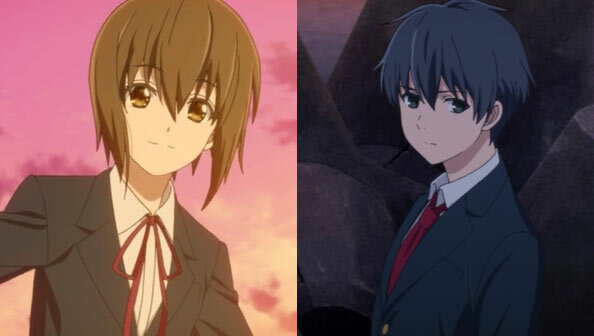 But last week showed that if one is patient with Sagrada Reset, one has a tendency to be rewarded accordingly. 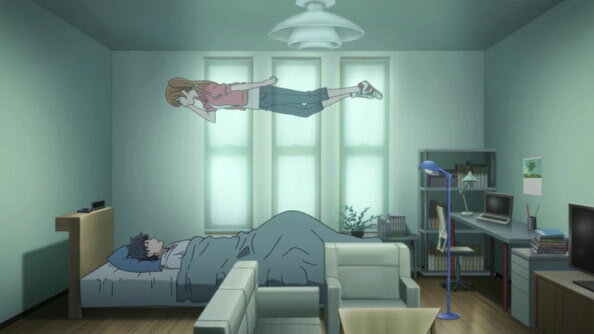 So it is that Asai’s classmate Minami Mirai (a fan of the occult) ends up suspended above his bed on a (second) saturday morning. Somehow saving the cat resulted in a present very different than the one Asai wakes up to at the start of the episode. 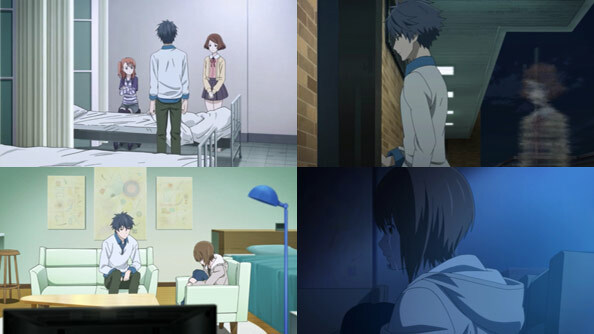 And it all has something to do with what Murase was doing while Asai and Haruki were saving her cat. We know she can fly, so that’s a start. 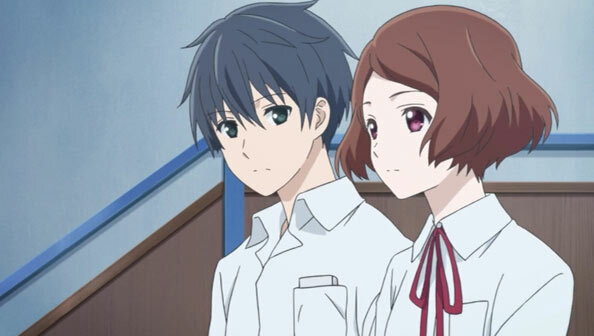 But so far, this show solves mysteries in episode pairs, so we’ll have to wait until next week to see where this is going (or where it’s gone).